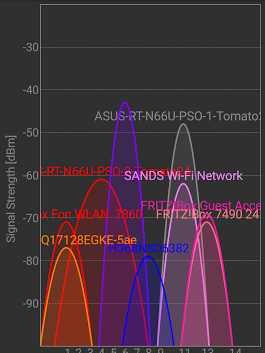 Amsterdam, 2.4 GHz. 5 GHz is only marginally better. In the city, wired connection is the only option: fiber, cable, dsl. For me, too often – even at home – mobile internet is faster than WiFi over 2.4 Ghz and sometimes even faster than WiFi at 5 Ghz.. If you’re in Delphi land, then Asbjørn Heid is a a guy to follow on G+. He has some brilliant snippets (most can be found on paste.ie by searching for Asbjørn Delphi site:paste.ie).